Here is the post on the G45 Blog announcing the finalists…..all their blogs are linked, and I highly recommend checking out these super talented and creative crafters. The projects you’ll see will amaze you! Another blog post worth checking out is on the Canadian Scrapbooker magazine website (Editor Jackie’s blog) where you will find my tutorial on how to use DCWV Fabric Paper to make a card. 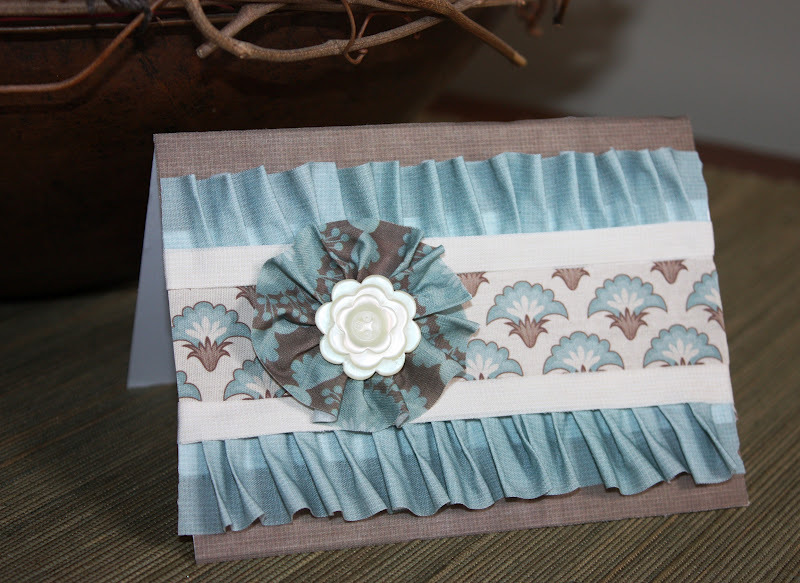 This card is made ONLY with DCWV Fabric paper on a white cardstock base. And the vintage button is Tim Holtz. 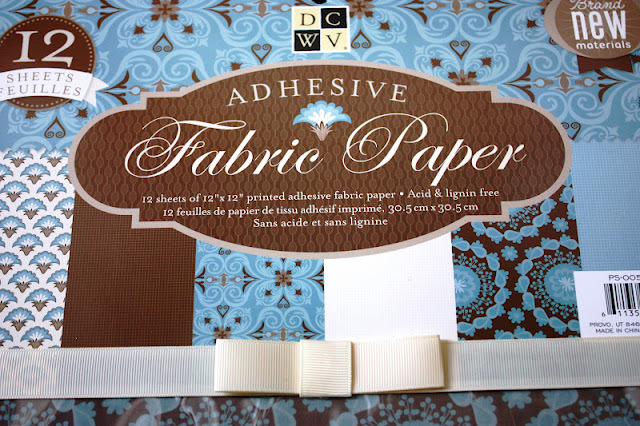 This self-adhesive Fabric Paper is soooo cool and super easy to design with. Don’t you just love the blue and brown colour palette? I also made a similar flower for this heritage page of my mother’s class at school, using Graphic 45’s ABC Primer collection. So if you feel like making a simple but pretty flower, head over to my Canadian Scrapbooker blog post tutorial, pick up some DCWV Fabric Paper and and get started! 11 Comments on Exciting Times!! It was no surprise to me that you made the Top 30! I’m rooting for you to get on that team! GO KELLY GO! The fabric paper looks awesome. I’ve never seen it before, but now I’m going to have to check it out! Your card is so cute and I love that little flower you made with it. I’m with Char…GO KELLY GO!!! If you need a cheer team, I’m there! I love your projects! I love the fabric paper on your card and layout! It wouldn’t matter what you made Kelly, you can always make it gorgeous! Congrats on the top 30! I think you would be a perfect fit for the G45 team! Please let me echo all the justly deserved kudos you have received so far. You are a talented artist and it is great to see those talents recognized by the paper companies like Graphic 45 as well as the scrapbook publishers like Canadian Scrapbooker. I am keeping my fingers crossed that you make the final design team. In the meantime, keep posting all your beautiful work. What a beautiful and creative card my friend!!!! And woow big big congrats!! Congratulations!!! How awesome to see your name posted as a finalist. wahooo!!! Cheering for you as you enter the next round. Well, first, a big yahoo on being named among the G45 finalists. No one who frequents your blog is surprised by that. I’m constantly amazed by the G45 projects you feature here. Like this one! 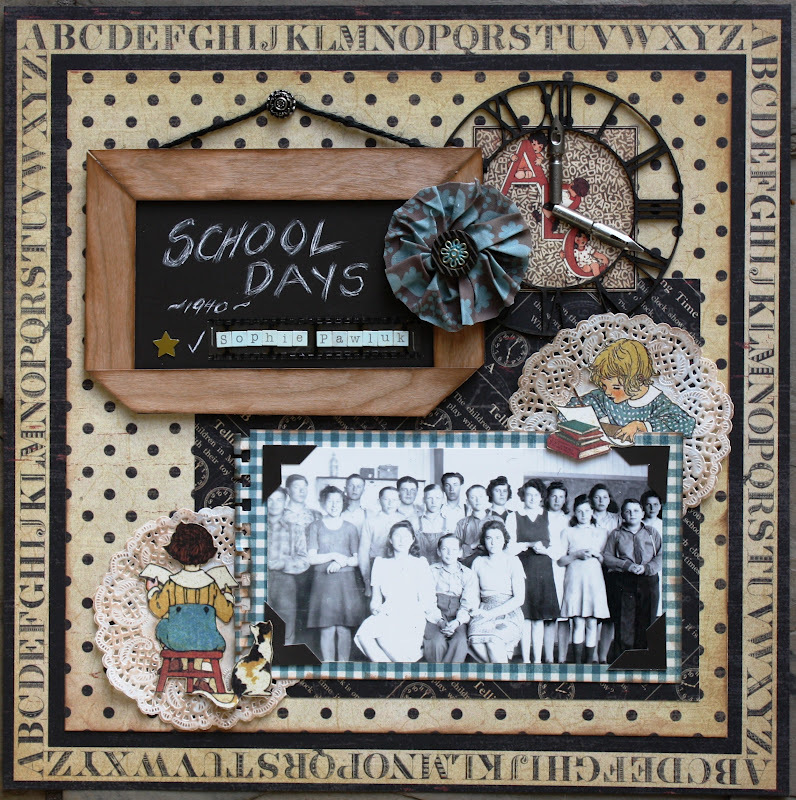 LOVE the “school days” layout. So creative. The little girl peeking over the photo is just the cutest touch. As for your card, it’s delightful. I’ve never heard of fabric paper but now I want some! Enabler! Congratulations! That is so exciting for you! I love the LO of your parents farm for the Urban kits! So beautiful – I love that paper and OA line! Great job! And thanks for all the sweet comments you leave on my blog! Good luck!